Please join us for the third in our series of four webinars on Community Choice Agencies (CCAs) and Integrated Distributed Energy Resources (IDERs). This webinar will focus on potential opportunities for CCAs to selectively work together to optimize efforts and resources, through continued knowledge sharing and ultimately collaboration as they define their role in the deployment of IDERs. As the Community Choice movement continues to grow and rapidly evolve in California, changes in market conditions and the regulatory landscape such as price volatility, the PCIA decision, changes in Resource Adequacy procurement, etc., are creating new challenges and barriers to entry for new and existing CCAs. Our focus will be on how collaboration between CCAs can help the agencies reduce costs, stabilize and fortify competitive retail rates, and reduce risk exposure as they navigate through the challenges and barriers ahead. As a primary example, we will explore how CCAs can benefit from a collaborative approach to developing an integrated CCA data platform. Our presenters for this webinar include Taj Ait-Laoussine, Vice-President, Technology & Analytics for East Bay Community Energy, and Chris Sentieri, Senior Manager of the Climate Division, Blue Strike Environmental. Mr. Sentieri will lead off by framing the rapidly changing situation, providing some context about the need for CCAs to get more sophisticated, a vision for how a data platform fits in, and what it can eventually enable, including IDER deployment. Mr. Ait-Laoussine will follow with a non-technical presentation about how to visualize the data platform, how it’s already paying dividends and could evolve, and then explore concepts of potential collaboration. The AT&T Pebble Beach Pro-Am is one of the biggest events on the Central Coast, and with the thousands of people eating and drinking it creates mountains of trash. “Our job out here first and foremost is to take care of the golf course, and all the waste that comes off the golf course,” COO Blue Strike Environmental Rico Tesio said. For the past five years the Pro-Am has been a zero waste event. The event has been Gold Level certified by the council for responsible sport in each of those five years. “Millions and millions of dollars in hotel rooms and restaurant tabs, and all that goes on this week but there’s a tremendous environmental footprint that goes along with that that often times doesn’t get seen,” Tesio said.  The tournament hires Blue Strike Environmental to make sure garbage form every purchase is properly handled. Last year, there was more than 170 tons of waste throughout the event. Blue Strike hires local non-profits like Victory Outreach Home in Salinas to help pickup and sort that waste. “Make sure the recycling is recycled so it can be reused, and the trash that is compostable goes to the compost and the the trash trash is separated out,” Sarah Ingraham from Victory Outreach said. “When we come out here it actually helps out our homes, it helps keep the doors open for our ministry,” Ingraham said. IN 2018, 91% of the events waste was diverted from the landfill. “To be able to minimize that only allows these events to continue to give back to the communities buy not damaging and hurting them,” Tesio said. Tesio said this event produces more waste than any other on the central coast, but it will be nothing compared to the U.S. Open coming to Pebble beach in June. This year the tournament is seeking an environmental certification from the Golf Environment Organization. Lafayette has served as a sustainability leader among Colorado communities. As such, the City Council of Lafayette strongly supports the scientific consensus that the earth’s climate is warming as a result of human activities which are releasing unprecedented quantities of carbon dioxide, methane and other greenhouse gases into the atmosphere. As a community, we understand that the local effects of climate change, such as potential for more extreme weather events resulting in wildfire and flooding, may have an impact on Lafayette residents and its economy. Community organizations led by the East Bay Clean Power Alliance are thrilled with the adoption tonight of a groundbreaking plan for local clean energy investment by East Bay Community Energy (EBCE), Alameda County’s new Community Choice energy program. A portion of East Bay Community Energy net revenues from electricity sales will now be invested into providing local clean energy benefits. This action makes EBCE the first Community Choice program in the nation to launch with genuine roadmap and commitment to bring local development and health benefit to the community. 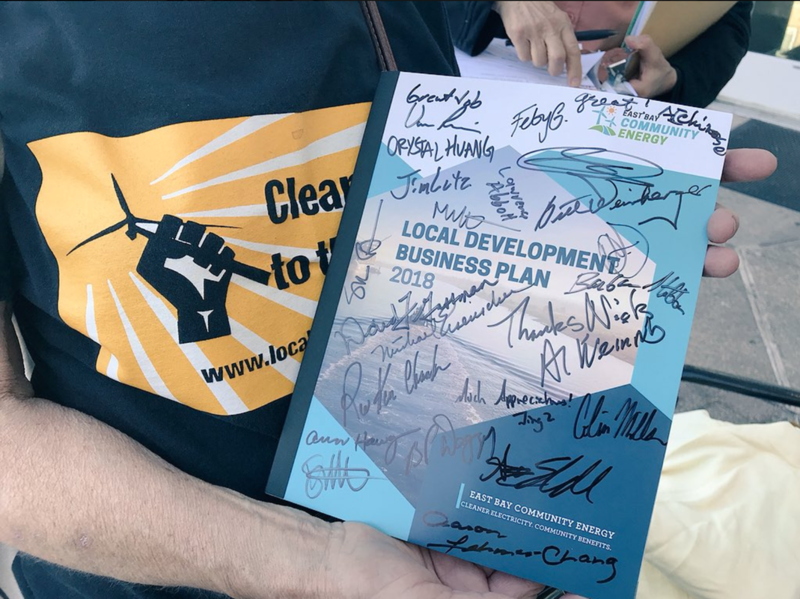 The Local Development Business Plan (LDBP), as it is called, can maximize community benefits such as local solar, wind and energy efficiency projects and incentives for the East Bay. In addition, East Bay Community Energy is utilizing outside grants to fund some local development projects such as solar and storage on critical facilities such as fire stations and hospitals. The LDBP was adopted in a unanimous vote by the EBCE board. Many community leaders gathered for a “Clean Power to the People” rally in support of the Plan’s adoption before the EBCE Board meeting. These leaders have been advocating for an East Bay Community Choice program with a commitment to local clean energy solutions for years. “Thanks to efforts of the East Bay Clean Power Alliance, the East Bay Community Energy program has the potential to bring equitable economic development and jobs to communities throughout the county as well as increase the amount of electricity that comes from local clean energy resources,” said Jessica Tovar, coordinator of the East Bay Clean Power Alliance. “The Local Development Business Plan will ensure East Bay Community Energy is on track to fostering local economic and climate benefits, such as creating clean energy jobs and developing local renewable resources, while also moving toward a clean energy economy,” said Luis Amezcua, member of the Executive Committee of the Sierra Club San Francisco Bay Chapter. Community health and safety is critical for our frontline environmental justice communities. “As Nurses, we witness how extreme forms of energy extraction impact human health," said Martha Kuhl, RN, Board of Directors Treasurer for California Nurses Association and First Vice President of the Alameda Labor Council. "Nurses at the bedside see the daily impacts that pollution and toxic emissions have on our health — environmental toxins lead to higher rates of asthma, liver damage, heart and lung disease, cancer, and birth defects." The creation of EBCE aims to bring climate justice to disadvantaged communities. As a government agency, EBCE has the ability to take in the needs and voices of the people. “About 800 of the Asian Pacific Environmental Network (APEN) members who reside in Alameda County have tirelessly fought for climate justice on both the state level and the local level," said Jing Jing He of Asian Pacific Environmental Network. "We believe the implementation of the Local Development Business Plan is essential to advancing structural changes and outcomes that create opportunities for low-income communities." The plan for local clean energy investments in East Bay Community Energy is a game changer. “There is a myth that says we must choose between our jobs and our environment, but we know that there are no jobs on a dead planet. We don’t have to choose between jobs and our environment; we can create quality, green jobs through rebuilding our infrastructure and investing in renewable and sustainable energy,” said Anne Olivia Eldred, Chair of East Bay Community Energy’s Community Advisory Committee. With this achievement in place, East Bay Clean Power Alliance is organizing to further engage the community to call for millions of dollars of investments towards local clean energy development from a portion of the projected $43 million in net revenues in the first year of EBCE operations. In October 2016, East Bay Clean Power Alliance, an Alameda County-wide alliance, called for a ground-breaking program that would prioritize equitable development of local renewable resources, creating union and family-sustaining jobs, stimulating local businesses, and include direct community representation in the governance of the program. East Bay Clean Power Alliance called for a business plan to study where and how East Bay Community Energy can invest and incentivize solar, wind and energy efficiency projects. Alameda Board of Supervisors agreed by allocating $500,000 towards a Local Development Business Plan study for East Bay Community Energy. 2018 AT&T Byron Nelson: Let's talk trash! Imagine a golf tournament that had no trash cans. What if you came up to a green and there were bottles and trash everywhere? That would be awful. That will not happen at the AT&T Byron Nelson because Blue Strike Environmental is on duty. They have a team of 40-60 people who empty trash cans from 6:00 AM – 8:00 PM every day, and then actually empty each bag of trash. They rip it open and remove every piece of trash, separating out recyclables, compost and trash. Their goal is to recycle 50% of the garbage, and divert another 20%. Divert means to repurpose things like carpet and wood. The carpet, for example, is going to be donated to people who need it. Yay! I got all this fascinating information from Rico Tesio, CEO of Blue Strike Environmental. He estimated that each PGA Tour event produces an amount of 100-150 tons of trash. Can you believe that?! Tessio’s team has enormous help from the company Champion. They help by picking up the garbage and compost. A lot of the compost is hot dogs, banana peels and watermelon. It smelled awful! It honestly made me feel a bit nauseous. The awesome people helping sort the trash are volunteers from local schools or organizations such as Spruce High School Alumni Association and the Pemberton Trinity Forest Neighborhood Association. They do this work to raise money for their groups. Final thing before I go – today was so hot we were smacking sweat off our head. But the Blue Strike Environmental team felt even hotter. I think they have one of the hardest – and most important – jobs that you can have at a PGA Tour event. The city of Santa Barbara has vowed to transition entirely to clean and renewable energy, following a City Council vote on Tuesday establishing 100-percent sustainable energy goals by 2030. The resolution adopted sets both a community-wide and municipal facilities objective to reduce fossil fuel use through increased conservation and efficiency, and by developing renewable energy sources. The motion also committed to a 50-percent renewable energy goal by 2020 and 100-percent renewable energy for the city’s community electricity supply by 2030, but no specific plan is yet in place. Santa Barbara represents the first city on the Central Coast to make the pledge, and the resolution comes less than a week after President Donald Trump’s decision to withdraw from a global agreement aimed at reducing greenhouse gas emissions. “President Trump may be withdrawing the U.S. from the Paris Climate Accord, but cities are stepping up and re-committing to adopt, honor and uphold the Paris Climate (Accord) goals,” Mayor Helene Schneider said. Schneider became one of first United States mayors to endorse a vision of moving away from fossil fuels to 100 percent renewable energy. This spring, she joined the Mayors for 100% Clean Energy initiative of the Sierra Club's “Ready for 100” campaign — a coalition intending to uphold renewable energy and healthy communities. The specific steps the city would take to achieve a 100 percent renewable goal are unknown, according to a staff report. City staff members are expected to develop a work plan, including financial resources and setting a timeline to achieve the goals by Dec. 31, 2018. Santa Barbara’s future sustainability efforts and projects include water conservation, energy management, wastewater resource recovery, habitat restoration, urban forest enhancement and solid waste management. Reducing citywide transportation congestion by implementing bicycle and pedestrian master plans, pursuing solar opportunities at city buildings, and restoring riparian vegetation and habitat were noted as the city’s sustainability projects. Renewable energy tends to be more expensive compared to non-renewable sources, according to a staff report. City facilities using natural gas instead of, or in addition to, electricity involve significant challenges in relation to the renewable energy goal. Converting existing facilities — such as the Los Baños Del Mar Pool — from natural gas to electrical energy would be “difficult and extremely costly to achieve,” according to a staff report. The staff report noted the cost of natural gas is lower than alternative fuels. Approximately 30 percent of the electricity currently used by Santa Barbara is deemed renewable, according to a staff report. City staff noted that the remainder is comprised of non-renewable electricity supplied by Southern California Edison and natural gas provided by Southern California Gas, which is used to heat city buildings and other facilities. Santa Barbara could establish its own renewable sources, purchase renewable energy credits, or voluntarily pay for renewable energy through Edison to achieve the 100 percent renewable goal. Santa Barbara is joining 29 cities nationwide that have devoted to achieving 100 percent renewable energy targets. San Diego, San Francisco, South Lake Tahoe, Del Mar and Palo Alto are some California cities that have made the commitment. The vote comes after the Santa Barbara Chapter of the Sierra Club and the Community Environmental Council endorsed the transition and requested the council adopt renewable energy goals during a Sustainability Committee meeting in April. City staff worked with the Sustainability Committee since 2006 to implement a handful of long-term sustainability projects often directed by state regulation. Katie Davis, chairwoman of the Santa Barbara Chapter of the Sierra Club, said the organization’s members salute Santa Barbara for their leadership on 100 percent clean energy. “To meet our international climate goals, we must transition away from fossil fuels to renewable sources of energy,” Davis said. “Moving to 100 percent renewable energy isn’t just the right thing to do for our climate, it’s the smart thing to do for our local economy. Renewable energy costs have decreased dramatically and are now cost competitive with fossil fuels, and Santa Barbara County already has eight times more jobs in clean energy and energy efficiency than in the oil industry. ​​Sustainable hospitality has a major influence on engaging businesses with our local community. For the third consecutive year, the AT&T Pebble Beach Pro-Am has received the prestigious Gold Certification from the Council for Responsible Sport. Hosted by the Monterey Peninsula Foundation, the tournament has become a model for other PGA TOUR events by establishing itself as a reliable leader in environmental protection. In conjunction with key partners including Pebble Beach Company and The Offset Project, the AT&T Pro-Am introduced key composting and re-use strategies three years ago in an effort to achieve high standards of waste diversion. The “green” commitment has since been expanded and enhanced, and resulted in the Council’s gold certification honor in 2014, 2015 and 2016. According to Shelley Villalobos, Certification Director for the Council for Responsible Sport, the 2016 Gold Certification required a huge amount of sustained effort from the entire event management team. “With this gold level recertification, the AT&T Pebble Beach Pro-Am team has shown a strong commitment to both rigor and transparency—qualities that have helped them advance their performance in many aspects of hosting a more sustainable event, from waste management and diversion to procurement and creating a lasting legacy in the community. This is a tournament to be embraced and celebrated,” Villalobos said. 120 Dumpsters were pulled from the event, only two of which were considered trash. Just two other tournaments on the PGA TOUR – the Shell Houston Open and Waste Management Phoenix Open – have earned certification status from Council for Responsible Sport.